Vacation Rentals in Destin is a co-operative of property owners that offer their Destin area vacation homes for vacation and holiday rental. Here are the direct links to the properties that that are available. If you are unfamiliar with the area, here are a couple of maps to get you oriented. Our Paradise!! Where sand is like sugar and the Gulf waters are aquarium clear and emerald green. From Championship courses to putt-putt, our area is rich with golfing opportunities. Experts and the not-so experts can play amiably with the quality and variety of courses at hand. If you're an angler you've picked the right place to spend your vacation. From Bay to Gulf our area is known for its abundance of fish. Come find out why Destin is rightfully called "The Luckiest Fishing Village in the World". Take a break from the beach or golf and have an afternoon adventure among the 100+ upscale outlet shops in Silver Sands or Morgan's, where adults & children alike will find every game imaginable and a soft-play area is available for the little ones. Stroll through the food court for a tasty treat, or have a seat for lunch or dinner at one of the many gourmet eateries. Water, water everywhere, and what a lot to do! Rent a pontoon boat or jet skis, dive off the sandbar for sandollars, or snorkel off the jetties for a glimpse of tropical fish. Take a parasail ride and wave to the pelicans. There are sunset cruises from the Destin Harbour, dolphin watch cruises, and windsurfing. 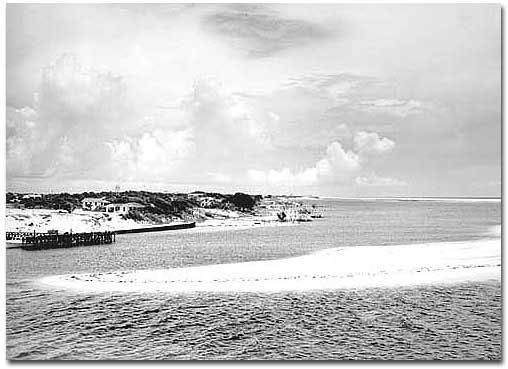 Want a little Destin history? .... look below. Located in the Florida Panhandle along the emerald waters of the Gulf of Mexico, the City of Destin has a rich history dating back to American Indian inhabitants. Spanish explorers surveyed Florida in 1538. Don Francisco Tapia was commissioned to survey the Florida coast and in 1693, drew the first known map of Destin's East Pass and its shores. Destin modern history is attributed to a fisherman, Captain Leonard Destin, who moved here from New London, Connecticut, and settled in Northwest Florida in about 1845. Captain Destin began the fishing industry and Destin has maintained its successfull fishing activities to the present. Known as the "World's Luckiest Fishing Village", the largest and most elaborately equipped fishing fleet in the State of Florida docks at the Destin Harbor. In addition to fishing, recreational opportunities include golf, tennis and watersports, including diving and snorkeling. The 100 Fathom curve draws closer to Destin than any other spot in Florida providing the speediest deep-water access on the Gulf. With the growth and development of Destin from a small fishing village to a major tourist resort the need arose for a local government structure. The City of Destin was originally chartered as a municipality in 1984. 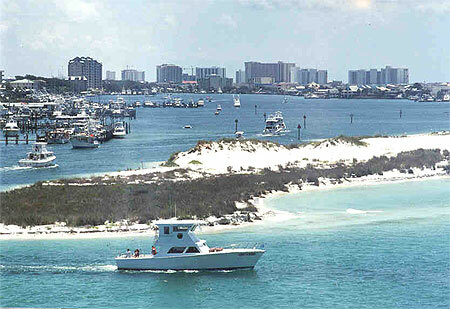 The City of Destin is home to 11,068 full-time residents (1998 Official Estimate of Population, State of Florida). However, the Destin area swells to hundreds of thousands during the summer months. And, this population renews itself three to four times a month! Destin is also attracting many "snowbirds" in the fall and winter months. Our northern visitors are learning that the Florida Panhandle area can offer a pleasent and comfortable retreat from the harsh climate of northern winters. Destin is now a modern city/resort area. While fishing is still a major draw of sports enthusiasts from around the world, the beaches of Destin offer much more. Amusement parks, watersports and a family oriented atmosphere attract a wide variety of tourists. The Destin area also boasts a huge selection of golf courses both public and private. Regardless of interests, Destin provides a well rounded selection of vacation possibilities.